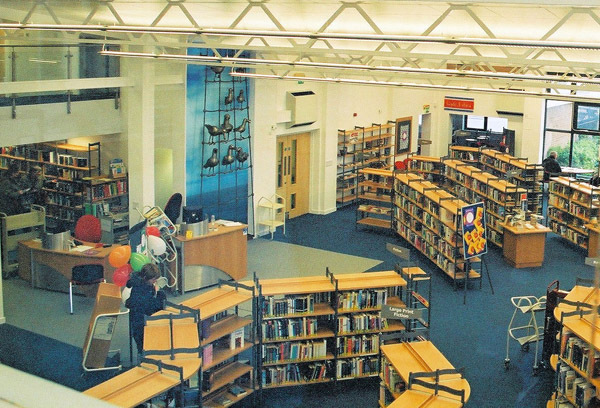 The library opened in 1966 and had changed little, becoming very dull and cramped. 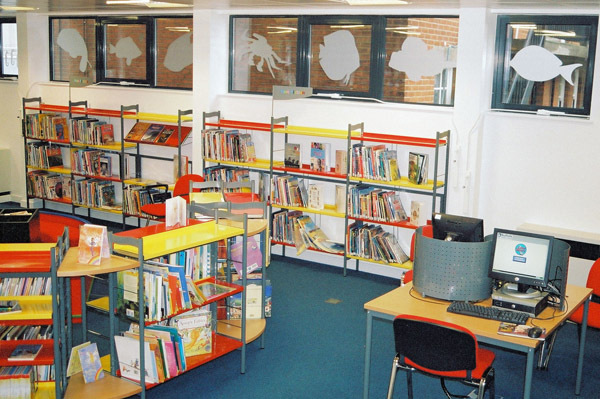 There was built in shelving and no lift access to the mezzanine floor. A 2-storey extension was built at the rear without disturbing the unusual roofline, increasing the floorspace from 515 to 782.5 sq m. to accommodate the lift, accessible toilet and create a large meeting room (Room at the Top) with a kitchen, and a smaller one. 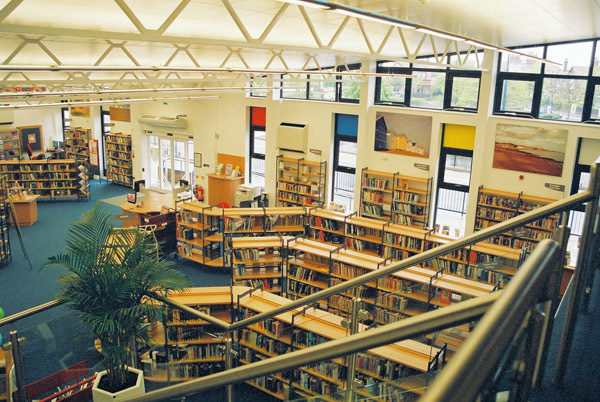 The staff area was moved to the mezzanine to free up the ground floor for the public. The old staff area now has a cafe run by Social Services as a social enterprise for adults with learning difficulties. It has an internet cafe bar, a flat screen TV and a variety of seating. A fully accessible floor was installed to facilitate changes to computer layout in the future. 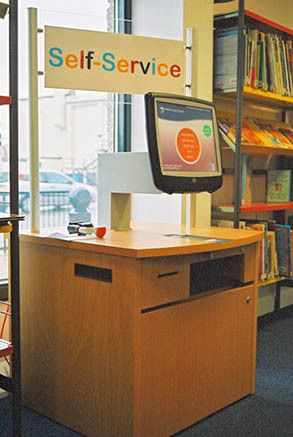 Felixstowe is the first public library in Britain to have the Schultzspeyer Rondea shelving. 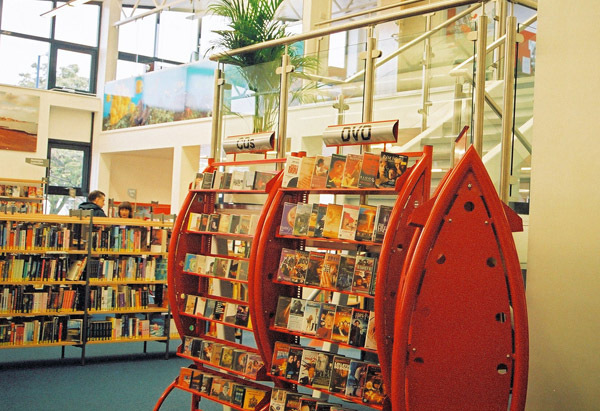 A bay of which was set up in the library for staff and public to assess before purchase.Together with the white walls it helps create a light and airy atmosphere. 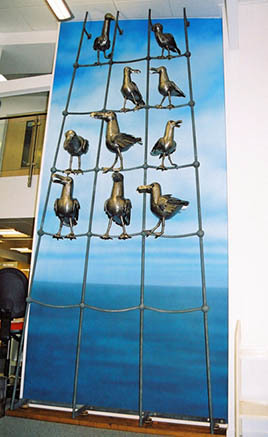 The main and most popular feature is a steel sculpture by Suffolk artist Paul Richardson, of seagulls on rigging. The sea theme is continued in the pictures of the docks and the seafront on the walls and the bookboat in the children's area. The counter has been replaced by 2 experimental staff pods, one seated, the other standing height.